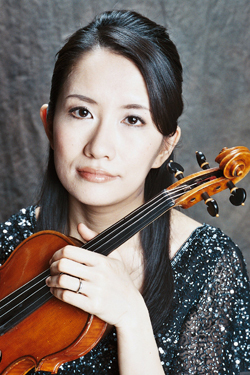 Violinist MAYA SHIRAISHI joined the New Jersey Symphony Orchestra in 2007. She was previously a member of the Honolulu Symphony and Hawaii Opera Theatre. In Hawaii, she recorded with the prestigious Hawaiian singer Keali’i Reichel on his album Ke’alaokamaile, which was nominated for a Grammy Award in 2005. A native of Japan, Shiraishi received Bachelor and Master of Music degrees from Tokyo National University of Fine Arts and Music (Geidai). She gave the world premiere of Yoshimi Okeda’s Piece for Violin and Orchestra in Tokyo and has been a winner in several competitions. She attended seminars in Japan and England with the Amadeus Quartet and performed in both countries as a member of the Sunrise String Quartet. In the United States, Shiraishi studied with Masao Kawasaki on scholarships at The Juilliard School, where she received a master’s degree in 2001. She has also studied with Garrett Fischbach from the Met Orchestra and Yoko Takebe from the New York Philharmonic. She has given solo and chamber music recitals at Lincoln Center in New York and at the Spoleto Music Festival in Italy. She was a member of Bravo Chamber Music in New York and joined Orpheus Chamber Orchestra’s Japan tour in 2014. Her chamber music teachers include Seymour Lipkin, Jacob Lateiner and the Juilliard Quartet. Shiraishi was a faculty member of the Greenwich Conservatory in Connecticut from 2005–11, and she has been a board of advisors at Arete Music Academy in New Jersey. As a dedicated teacher, she has had a successful teaching studio for 25 years. Her current and former students are in some of the prestigious schools in the country including The Juilliard School, Yale School of Music and Special Music School at Kaufman Music Center.